Fiona Bruce and the team are at Dumfries House in Scotland. Objects valued include an early toy train and a glass vase, and HRH the Prince of Wales is interviewed. Browse content similar to Dumfries House. Check below for episodes and series from the same categories and more! How far will you go to woo your beloved? love nests you'll ever see, only to be rejected by his intended. Welcome to the Roadshow from Dumfries House in Ayrshire. proud Scot and a huntin' shootin' fishin' enthusiast. a surprisingly feminine and highly fashionable house for the time. of Chippendale and Scottish furniture from the mid 18th Century. a great Scottish rebuilding programme, making and creating contemporary Palladian mansions. Dumfries House became a hot bed of cutting edge design, from Thomas Chippendale's Director Catalogue. This is the best collection of that style you'll ever see. with their coquettish curves and come hither flaring. This table and chairs cost £85 and were placed here for after dinner card parties 250 years ago. And they haven't been moved since. who produced a rather more masculine look than Chippendale. The Earl of Dumfries built his home for love of a woman and then she rejected him. immediately fell out of fashion. until last year when disaster almost struck. were very close to going under the auctioneer's hammer. and I'm delighted to say that Prince Charles will be joining us to tell us more. to meet our experts for this week's Roadshow. Well, this is a charming little cabinet. Do you know anything about it all? -Not a thing, not a thing. OK, so is it a family piece? No, no, no, I bought it at a house sale 15 years ago. -Right. How much was it then? Well, that was a good buy. I've always thought so because I love it. Well, that's good, it is a little Italian cabinet. ah... his latest purchase, his latest object of art. -Inside here you see it's quite plain. -rather like an inner hall, OK? to his cabinet friends, only his closest associates. -And that's where we get the word Cabinet in government from. and it uses ebony and ivory in this amazingly delicate pattern. You see these shapes, right? -They're figures in black, right? just as we can see here, and there it is. -stand out in black and white, like that, OK? I think you did very well with your £300. I should think you've probably earned round about £2,500 on it. That's amazing! Ooh, that's amazing! I'll come shopping with you next time! No, I bought this instead. Your husband sent you to buy a lawn mower. -he said, our lawn mower's had it. -We need a lawn mower, yes. -And so you came back with that. -He must have been really thrilled. -Oh, thrilled, he was absolutely amazed! -I'm sure he was amazed. so this was the better buy. -Thank you very much indeed, wonderful. local in so far as that collectively they get known as Mauchline ware. because, of course, they popularized anything Scottish. for maybe £50 to £80. around the £100 to £150 mark. Now, the collection itself was put together by yourself? right through to about 1970.
and your father, which one would it be? which is a Cumnock made box. Let me put it there. The scene it depicts is a very famous covenanting scene. they dragged three covenanters out into the town and shot them. -And this is the scene depicted on this lid. -do you know how much your father paid for them? admit to anything more than that. In the '60s, it was a lot of money. Yes, but its importance has been spelt out. There's a label on this box which says Clyde Model Dockyard. whether they were yachts or trains or whatever. -Now, did you know the shop, Clyde Model Dockyard? When we were kids, we used to go and get all our toys there. balsa wood you need to stick them all up together. It was a great place. if we've got something good quality inside it. Off comes the lid, out comes the first bit of rail. between the tracks here, so that's a good sign. I'm going to ask you to pop that on the track. Please put it on the track. so that we can see it in all its glory. the GBN stands for Gebruder Bing of Nuremberg. they were just being the retailers rather than the manufacturers. He obviously never played with it. Oh, he did, he used to run it in the garden. -Run it in the garden? -and he could run it. He must have looked after it very well. and here are all the accoutrements to fill the spirit burner. and it would operate by live steam. It's a huge excitement for me to see a train like this. I have never seen a better one. It is in fabulous condition. not because of its outline but because of its condition. Well, you know, is it going to be worth £5,000? The answer is certainly it's going to be worth £5,000. you could see it going for between £7,000 and £10,000. an excited expert, and what a remarkable object. I reckon that may be even more cherished from now on. and Dumfries House is a bit of a jewel. I told you about the rescue mission to save this house. Well, the support of one man in particular was invaluable. 'Prince Charles spearheaded that rescue mission. Your Royal Highness, why was it so important to save Dumfries House? but you can imagine it was quite a challenge. because it was a last-minute reprieve in the end? a hell of a lot to find. and drove all the way back, and it was as close as that. Now, we've had the privilege of filming in many of the rooms here at Dumfries House. Do you have a favourite room here? which I think is incredibly special. and that Bassano painting which is set in this rather beautiful frame. has again a unique atmosphere, so that's my favourite room. frustrated people who had their eye on all these bits of furniture! Can you imagine what would have happened to this house? and all the pelmets, everything. we would have been left with a crumbling ruin. from the Prince of Wales at the end of the programme. Meanwhile, back to the experts hard at work in the gardens. No, I'm the caretaker of the house, look after the house. you're more the custodian - you've been here some years. we just love all the contents that's in the house. and you've seen the original documentation for this piece. Yes, I've seen the original receipts for the furniture. Do we know how much this cost? It cost six pounds, eight shillings. Six pound... When was that? quite thin, but straight, it's never warped. Now it's never warped because the house has been allowed to breathe. And that's what you've done. -told me when the house should be open and when it should be closed. -And you picked it up from there? Picked it up from there. but the proportions have that little edge to any other of the period. is it a breakfast table or a supper table or a tea table? On the original receipt, it was called a breakfast table. pearls of wisdom, some were not. was to store the silver for breakfast or fine porcelain. Now, you've got a better story than that. -all these houses had dogs in them. And they put the breakfast in there, and the dogs couldn't get in to eat the breakfast. Grandma, I think you've got a lesson to come there. Well, who could possibly dispute such a practical story? Whether or not it's true doesn't really matter, it happened in this house. It's of a Pembroke type. You see them in most good stately homes. because there isn't another one like it, this is so fully documented. and fancy living with this lot for 11 years. I have a pretty good job but I'm envious, I really am. And I think you've done a wonderful job, and continue to do so, and, and I hope to come and see you again. Now, this is what I would call a "love it or hate it" object. I bought it 30 years ago and it hangs in our home and we love it. I'm glad you said that because I absolutely love it. It's the most fantastic pietra dura picture I've seen in years. Do you have any idea what it's sort of made of? inlaid marble but I really don't know. I mean pietra dura literally translated means "hard stone". which you'd have taken in the late 18th, early 19th century. I'd sort of date at sort of 1880, the late 19th century, basically. Um, but the quality of it is just mind blowing. is individually cut and chosen for its shading purposes. purely to give the illusion of a reflection. Where did you get it? which was being wound up, and I've had it ever since. -And how much did you pay for it? -I paid £110 for it. Wow, which 30 years ago would be £800 or so, is that? Yes, yes, that was quite a lot of money. It's just such a stunning piece. It needs an international market, it's such a good piece. won't be selling it, it'll be staying in the family. We're all sheltering out of the rain in here. Hello, this looks interesting. What's in here? Yeah. Yeah it's snuff mole. A snuff mole, can I have a look? -Can I lift it out? -I feel funny about touching it, actually. So what in heaven's name is this, then? -You use it for taking snuff. -Where its brains would be? -Yeah, basically where its brains would be. and wheel it around on these, on these wheels. that this was instead of smoking. It is truly hideous, isn't it? -Do you want to try some? -And the you just put it sort of in there. Yeah, and you sniff it up. -You'll be fine. You might sneeze. And then you have to sniff it up. OK. Oh, God, I can't believe I'm doing this. So we've got... we're lucky, we've come inside. the Isle of Jura so we always used to call it the Japanese box. So were you, as a child, allowed to play with it? but apart from that, it's in really good condition. Where do you keep it? when I was at university, it was my jewellery box. -And I know, and I had it in a rucksack... yes. Oh, no, no, no, I don't want to hear that! Haven't a clue, no, right. and it's a small chest called a kodansu. And it's made out of wood and then lacquered. and silver and these were used for keeping small objects in. was probably made for the Western market. and we've got swirling water. -and works of art like this, but the Art Nouveau Movement. And it started really in Japan. the most fantastic iridescent effect and then silver dots on here. It all works absolutely brilliantly. we would be looking around £1,500, £2,500. I've had it for so long now and I've loved it. -I've got to put my chequebook away have I? -No, thank you very much. in pinning them down. What's the history? Well, it came into our family about 1850 through my great grandfather. gave him the plate in exchange for the work that was done. They're not easy to date, but what a wonderful thing to have got. I mean, the dish itself is a great piece of slipware. You can feel the potter making it, can't you? sticky sludge but just trailed and dribbled on to form a pattern. decorate your home and then coming down in the family to you today. For slipware, it's not bad condition. it was around in the home but then, I suppose... Is it treasured now? -Where do you keep it? What's it doing in a cupboard? it has a great charm and nowadays, great value. I mean 150 years ago, it was worth the price of a job. -dare I say it doesn't look too much at first sight, does it? -Been through the wars a bit on the frame, hasn't it? At least it's behind glass so it's protected. -Now, what is it, do you think? William Nicholson, he painted it, he's the artist. while he was ill one summer and he painted it when he was here. -He'd been recuperating yes, from an illness. We always looked for a signature but we couldn't see anything. But it's indisputably his work. and sky beyond, it's lovely. what a complicated picture this is, when you start to really look at it. -Do you know about William Nicholson? If you could think of three of the most important Edwardian portraitists, he'd be one of them. -Encouraged to paint by Whistler. Augustus John and Orpen would be the other two, perhaps, but he's one of the greats. I'm not sure. I think it was before the war. into a much more, you know, much looser more relaxed form of painting. and they're very clean and they're very beautiful. So this is completely different then? Very experimental indeed, but I think it's a really interesting picture. these are brush marks, I think, going across the top of the meadow. in the region of £30,000. Oh, and I haven't cared when these little bits fell off. I wouldn't worry about the housework. or £60,000 might be closer to the mark. Royal Troon, Prestwick and Turnberry. Do you play golf? Yes, yes, I do play golf, yes. -Yes, yes, I play in Troon. are male and, um, you're the first female golf collector I've ever met. -What interests you in it? There's such a variety, it's fascinating, just really enjoy it. Well, you brought a lot along today. I'm going to select three that I particularly like. The first is what's commonly termed maybe a blacksmith's type. between the stem and the actual iron. This is an extraordinary one. Yes, I didn't think it was an actual golf club when I got it. Well, it looks like a segment of an orange doesn't it? -Um, but it's a driving iron, I understand? And this would have been used on the fairway or from a tee? if there were hoof marks on the course or rabbit scrapes. -So, this was to get you out of trouble? not really a golf club at all, is it? But it's a walking stick. that this was called a Sunday stick? That's right yes, a Sabbath stick, yes. -you were not allowed to play golf on a Sunday. -But you could go for a walk. you could turn it around and have a quick practice. And can I ask how much you paid for it? Yes, I paid £250 for it. -Which was not an insubstantial sum. -so I think that's a real beauty. -Well, thank you very much and good golfing. before you brought it along today? and then we thought, we'll hold on to it because we heard the Antique Roadshow was coming here. -But I actually bought it at a car boot. And it had like a plant inside it, a kind of purple plant. We bought it, for the plant because it was quite nice in the bowl. Yeah, so you're not emotionally attached to this, are you? -Well, do you know, do you know who made it? -I don't know anything about it. and that name is Lalique. -And so... Have you heard of Lalique? OK, well you're on a rapid learning curve today, aren't you? Well, let me tell you about Rene Lalique. a good pedigree and there's lots of different types of Lalique glass. Yours is that little bit different. um, because this originally would have been made in wax. into which you would then pour molten glass which would then fill the void. that a cire perdue piece, or a lost wax process is, is a unique piece. and in certain cases thousands of his other designs. So that makes it that little bit more special. -For plant. How much were they asking for the plant? I only paid a pound, well a pound, the vase and the plant, uh-huh. they say, "Have you ever broken anything on the Antiques Roadshow?" That's the most familiar question I get. The other question is, "What's the most expensive thing you've ever had on the Antiques Roadshow?" but I've got to tell you know that as of today, I think it might be this. Well, it's worth a mere £25,000. Now, we've had a lot of clouds over here today. You know that, don't you? And they do say that every cloud has a silver lining. Now, tell me about your loft. Quite a moment for Eric. and I think there'll be a bit of a celebration in one Ayrshire home tonight. Before we close, just time to hear about something of a new beginning. that was set up to look after Dumfries House doesn't end here. it's an enterprise close to the heart of the Prince of Wales. and to link the local community with the house. so that you actually create something really worthwhile. That's the aim, if it can be done well. because we haven't got any money, that will be a success. Your Royal Highness, thank you very much. It's been quite a visit to Dumfries House, with special guests and some unexpected finds. From Ayrshire, until next time, bye-bye. 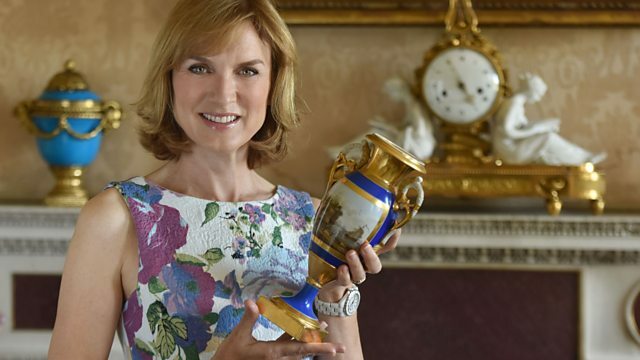 Fiona Bruce and the team visit Dumfries House near Ayr in Scotland. Objects intriguing the experts include an early toy train in remarkable condition, an outstanding example of Chippendale furniture, and a glass vase bought at a boot sale, which hides a stunning valuation. There is also a special interview with HRH the Prince of Wales about his involvement in the rescue mission to save the unique collection at Dumfries House from being broken up.